1. Tchernev G, Steinhoff M, Treudler R. Pimecrolimus in der Therapie des Morbus Hailey-Hailey. Poster beim 42. Tagung Deutschen Dermatologischen Gesellschaft, Berlin. 6-10. 5. 2003. published in JDDG, 1, Suppl., 167. 2. Fecker LF, Geilen CC, Tchernev G, Assaf C,Kurbanov B, Schwarz C, Trefzer U, Daniel PT, Eberle J. Decreased levels of proapoptotic Bcl-2 proteins in primary melanoma are associated with worse patient prognosis. Poster- beim Deutschen Hautkrebskongress und 15 ADO Tagung, Magdeburg, 29. 09-01. 10. 2005. JDDG, 10, 2005, 3, 844. 3. Tchernev G, Zouboulis CC. Folliculitis et perifolliculitis capitis abscedens et suffodiens. Poster beim 78 Norddeutsche Dermatologische Gesellschaft, 09-11. 09. 2005. Hamburg. Innsbruck, Austria. published in Archives of Dermatological Research, 296, 2005, 9, 442. 5. Fecker LF, Geilen CC, Tchernev G, Assaf C, Kurbanov B, Schwarz C,Trefzer U, Daniel PT, Eberle J. Decreased levels of proapoptotic Bcl-2 related multidomain proteins Bax and Bak in primary melanoma are associated with worse patient prognosis. Poster beim 33. Jahrestagung der Arbeitsgemeinschaft Dermatologische Forschung (ADF), Aachen, 23-25. 03. 2006. 6. Tchernev G, Nenoff P. Dissecting the pathways of tumour escape. Abstract, Poster, 70.7th EADV Spring Symposium Cavtat 2010, Croatia, 13-16. 5. 2010. 7. Tchernev G,Nenoff P. Molecular Mimicry, Epitope spreading and thepathogenesis of lichen ruber planus. Abstract, Poster, 7th EADVSpring Symposium Cavtat 2010, Croatia, 13-16. 5. 2010. 8. Tchernev G, Patterson JW, Salaro CP, Costa M, Nenoff P. The mystery, called lymphogranuloma venereum: uncommon clinical and histopathological features of “an ancient disease”. Abstract, Poster, 7th EADV Spring Symposium Cavtat 2010, Croatia, 13-16. 05. 2010. 9. Tchernev G, Cardoso JC, Tronnier M, Nenoff P, Karshakova D, Yankova M, Todeva V, Kurteva S, Ananiev J. Familial benign chronic pemphigus (Hailey-Hailey disease) – mimicking clinically intertriginous candidiasis: successful treatment with pimecrolimus. Poster-Abstract No. P 0456, 22nd World Congress of Dermatology (WCD 2011), Seoul, South Korea, 24-29. 05. 2011. 10. Tchernev G, Cardoso JC,Nenoff P, Patterson JW, Karshakova D, Yankova M, Ananiev J, Kurteva S. Acquired granulomatous haemorrhagic dermatophytosis of the beard due to Trichophyton rubrum – unusual clinical and histopathological presentation in “a German man”. Poster-Abstract No. P 1534, 22nd World Congress of Dermatology (WCD 2011), Seoul, South Korea, 24-29. 05. 2011. 11. Tchernev G, Tronnier M, Nenoff P, Karshakova D, Yankova M, Ananiev J, Kurteva S. Unilateral presentation of pseudokaposi´s acroangiodermatitis (Morbus MALI): a challenge for the clinician. Poster-Abstract No. P 2302, 22nd World Congress of Dermatology (WCD 2011), Seoul, South Korea, 24-29. 05. 2011. 12. Tchernev G, Cardoso JC, Nenoff P, Tronnier M, Karshakova D, Yankova M, Todeva V, Ananiev J, Kurteva S. Folliculitis et perifolliculitis capitis abcedens et suffodiens controlled with combination therapy. Poster-Abstract No. P0034 22nd World Congress of Dermatology (WCD 2011), Seoul, South Korea, 24-29. 05. 2011. 13. Tchernev G, Cardoso JC, Arseniev L, Okamoto H, Nenoff P, Karshakova D, Yankova M, Ananiev J, Kurteva S. Cutaneous anaplastic large T cell lymphoma – a therapeutic dilemma. Poster-Abstract No. P 1919, 22nd World Congress of Dermatology (WCD 2011), Seoul, South Korea, 24-29. 05. 2011. 14. Tchernev G, Patterson JW, Tronnier M, Karshakova D, Yankova M, Ananiev J, Nenoff P. Steven Kossard’s alopecia- pathogenetic mystery and therapeutic problem. Poster-Abstract, 14th EADV Spring Symposium, Carlsbad, Tschechien, 14-17. 04. 2011. 15. Nenoff P, Herrmann J, Krüger C, Tchernev G, Becker N. Bifonazole – in vitro activity against Corynebacterium minutissimum – an update of diagnostics and therapy of erythrasma. Poster, 18th International Congress of the International Society for Human and Animal Mycology, Berlin, 11-15. 06. 2012. 16. Tchernev G, Penev P, Nenoff P, Cardoso JC, Ananiev J. Modern aspects of diagnosis and therapy of onychomycosis. Poster, 9th EADV Spring Symposium, Verona, Italy, 6-10 Jun 2012. 17. Tchernev G,Ananiev J.Luetic meningoencephalitis masquerading as postclimacteric endogenous depression – a diagnostic challenge. 110 Jahre DSTIG – STI-Jubiläumskongress,DSTIG-KONGRESS 2012: 14-16 Juni 2012, im Berliner Rathaus, Germany, published in JDDG. 18. Tchernev G,Ananiev J.HPV-associated Buschke-Löwenstein tumours in a patient with diseminated anogenital form of Condylomata acuminata.110 Jahre DSTIG – STI-Jubiläumskongress, DSTIG-KONGRESS 2012: 14-16 Juni 2012, im Berliner Rathaus, Germany, published in JDDG. 19. Tchernev G,Ananiev J. HPV-associated verrucous carcinoma of the perianal region – a therapeutic challenge. 110 Jahre DSTIG – STI-Jubiläumskongress, DSTIG-KONGRESS 2012: 14-16 Juni 2012, im Berliner Rathaus, Germany, published in JDDG. 21. Nenoff P, Peter M, Magina R, Mulyowa GK, Mayser P, Ananiev J, TchernevG. Dermatosis papulosis nigra- case report from Uganda and update. Poster, 9th EADV Spring Symposium, Verona, Italy, 6-10 Jun 2012. 22. TchernevG, Ananiev J, Cardoso JC, Tronnier M, Okamoto H, Mizuno K, Kanazawa N, Gulubova M, Manolova I. The Mysterious disease Sarcoidosis and its possible relationship to the phenomenon of molecular mimicry. Poster, 9th EADV Spring Symposium, Verona, Italy, 6-10 Jun 2012. 23. Nenoff P, Schetschorke C, Schleicher G, Wenzel HC, Gruenewald A, Krueger C, Uhrlass S, Graeser Y, Ananiev J, TchernevG. Tinea faciei and Tinea capitis in two children due to Trichophyton species of Arthroderma benhamiae-molecular diagnostics using PCR and succesfull treatment by oral terbinafine. Poster, 9th EADV Spring Symposium, Verona, Italy, 6-10 Jun 2012. 24. Nenoff P, Peter M, TchernevG, Mulyowa GK, Amerson EH, Paasch U, Ananiev J, Manolova I, Gulubova M. Lichen striatus in Uganda – case reports and update of clinical picture, differential diagnosis and pathogenesis. Poster, 9th EADV Spring Symposium, Verona, Italy, 6-10 Jun 2012. 25. Tchernev G, Penev P, Kiriyak N, Ananiev J. Simplified dermatoscopic criteria for diagnosing melanocytic lesions of the skin: indications for surgical removal. P492, 21 CONGRESS OF THE EADV Prague, 27-30 September 2012. 26. 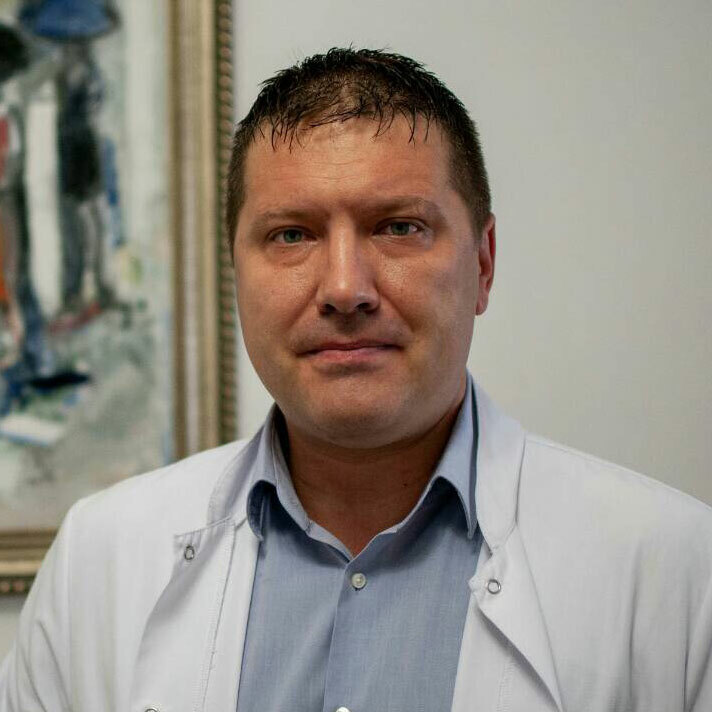 Tchernev G, Ananiev J, Gulubova M , Zouboulis C. Reactivation of Subacute Cutaneous Lupus Erythematodes under the Clinical Picture of Rowell Syndrome. Poster CRA13-0062 , 10 EADV Spring Symposium , Crakow, Poland, 23-26 May 2013. 27. Tchernev G , Gulubova M , Ananiev J. Nodular type basal cell carcinoma with atypical localization imitating granuloma teleangiectaticum- complete remission after surgical excision. Poster CRA13-0063 , 10 EADV Spring Symposium , Crakow, Poland, 23-26 May 2013. 28. Tchernev G , Ananiev J , Gulubova M. Giant Squamous Cell Carcinoma of The Tongue- A Sporadic Clinical Finding Within the Framework of the Dermatological Screening. Poster CRA13-0069, 10 EADV Spring Symposium , Crakow, Poland, 23-26 May 2013. 29. Tchernev G , Ananiev J, Gulubova M, Zouboulis C. A Rare Case of Scleredema Adultorum Buschke Associated with Monoclonal Gammopathy Type IgG-Kappa, Diabetes mellitus Type II And Initial Disturbances in Esophageal Motility. Poster CRA13-0082, 10 EADV Spring Symposium , Crakow, Poland, 23-26 May 2013. 30. Tchernev G , Ananiev J, Gulubova M. Ulcerative lesion in the inguinal area – a rare case of nonhornificated poorly differentiated metastasizing squamous cell carcinoma with a lethal outcome. Poster CRA13-0083 , 10 EADV Spring Symposium , Crakow, Poland, 23-26 May 2013. 31. Tchernev G, Nenoff P. Peri – and subunguales hematoma or acrolentiginous melanoma? Poster (IST13-0084), 22nd EADV Congress (02-06. 10. 2013), Istanbul, Turkey. 32. Tchernev G, Zouboulis CC. Atypical fibroxanthoma – a diagnosis of exclusion. Poster (IST13-0061), 22-nd EADV Congress (02-06. 10. 2013), Istanbul, Turkey. 33. Semkova K , Ananiev J , Gulubova M , Nenoff P , Tchernev G. “Dangerous” dark macule on the back presenting immediatly after unprotected sun exposure. Poster (ID: IST13-0127), 22-nd EADV Congress (02-06. 10. 2013), Istanbul, Turkey. 34. Ananiev J, Buchvarov E, Velev V, Abrashev H, Tchernev G, Gulubova M. Interstitial pneumonia linked to sudden cardiac death- unexpected in/out-of-hospital death-molecular and cell basis. 6th biennial meeting of the (AECVP) Association for European Cardiovascular Pathology, 9-11 October, 2014, Paris, France. 35. Chokoeva AA, Philipov S, Tchernev G, Wollina U. Primary cutaneous Angiomyolipoma of the Ear. Poster ID: P001, 12 EADV Spring Symposium, Valencia, Spain, March 5-8, 2015. 38. Tchernev G, Chokoeva A ; P0596, Nevus flammeus associated with dysplastic nevi and lichen sclerosus: possible common pathogenetic pathways. 25th EADV Congress, VIENNA, AUSTRIA, 28 September- 2 October, 2016. 39. Tchernev G, Chokoeva A ; P0660, Nevus flammeus associated with CEAN: possible common pathogenetic pathways? 25th EADV Congress, VIENNA, AUSTRIA, 28 September- 2 October, 2016. 40. Tchernev G, Chokoeva A ; P0816, Giant subcutaneous angiofibrolipoma: first report in the world literature. 25th EADV Congress, VIENNA, AUSTRIA, 28 September- 2 October, 2016. 41. Tchernev G; P0020, Erythema gyratum repens: The non obligate paraneoplastic eruption. 14TH EADV Spring symposium Brussels, Belgium, 25-28 MAY , 2017. 42. Tchernev G; P0149, Unilateral plexiform neurofibromatosis: The ultimative mutilating disorder. 14TH EADV Spring symposium Brussels, Belgium, 25-28 MAY , 2017. 43. Tchernev G; P0150, Multiple acquired basal cell carcinomas: Uncommon clinical presentation. 14TH EADV Spring symposium Brussels, Belgium, 25-28 MAY , 2017. 44. Tchernev G, Chokoeva A; P0156 , Cervicofacial actinomycosis overlapping with progredient (HPV-positive) Hypopharynx carcinoma: A Dermatologic Monster. 14TH EADV Spring symposium Brussels, Belgium, 25-28 MAY , 2017. 45. Tchernev G, Chokoeva A; P0157 , Subcutaneous located Gardner fibroma of the head of a Bulgarian child. 14TH EADV Spring symposium Brussels, Belgium, 25-28 MAY , 2017. 46. Tchernev G; P0190 ,Lichen amyloidosis associated with rheumatoid arthritis. 14TH EADV Spring symposium Brussels, Belgium, 25-28 MAY , 2017. 47. Tchernev G; P0192 , Melanoma in a Chinese Dragon. 14TH EADV Spring symposium Brussels, Belgium, 25-28 MAY , 2017. 48. Tchernev G; P0193 , Heel melanoma with a lethal outcome. 14TH EADV Spring symposium Brussels, Belgium, 25-28 MAY , 2017. 49. Tchernev G; P0395 ,ILVEN-Complete remission after Administration of Topical Corticosteroid! 14TH EADV Spring symposium Brussels, Belgium, 25-28 MAY , 2017. 50. Tchernev G; P0511 , ASIA- a dangerous Beauty? 14TH EADV Spring symposium Brussels, Belgium, 25-28 MAY , 2017.